For Nadya Ortiz, a chess scholarship opened a door she would never have believed possible — earning a college degree in the United States. Describing herself as the child of a “very humble family in Colombia,” the financial support allowed Ortiz to attend the University of Texas at Brownsville (UTB) for free and earn an undergraduate degree in computer science. Beyond UTB, Ortiz secured internships at a Swiss university to study computational neuroscience and at Apple Inc. as a software engineering intern. In May, Ortiz will graduate with a master’s in computer science from Purdue University, where she worked as a teaching assistant. Ortiz attributes these successes and many more to college chess. At UTB, Ortiz said she learned English and made friends for a lifetime. With support from the university, Ortiz said was able to become a Woman Grandmaster in chess, the first Colombian to do so. Several members of the Webster University chess team either declined to be interviewed or did not respond to email and Facebook messages asking for interviews. However, Ortiz’s sentiment seems to be shared by at least one member of Webster’s chess program. Israeli Grandmaster Anatoly Bykhovsky told the defunct news website The Daily in June 2012 that without a chess scholarship, he would have been unable to study in the United States. Paul Truong, Susan Polgar’s husband and marketing director of The Susan Polgar Institute for Chess Excellence (SPICE), told media at the time that the program’s departure from Texas Tech University (TTU) was necessitated because of the institution’s inability to provide better scholarship funding. Truong said SPICE had only been able to offer large scholarships after a $320,000 donation in 2007, which was to be distributed over five years. That donation was soon to run out, and so the couple searched for other options. In an interview posted on Polgar’s Chess Daily News website, Webster Provost Julian Schuster told ChessCafe.com that Webster’s players would receive scholarship packages comparable to Webster’s top scholarship award. In a letter to the editor sent to The Journal in April 2013, Truong said the collective GPA of the Webster chess team was 3.6. Webster’s top academic scholarship is the Presidential Scholarship. The award covers a student’s tuition for four years. To renew the award each year, a student must meet full-time status and maintain a GPA of 3.5. In that same Journal letter to the editor, Truong said several universities have larger scholarship budgets than Webster, and named the University of Texas at Dallas (UTD) specifically. Truong said despite its larger funding for scholarships, UTD hadn’t achieved the success Webster had. In 2011-12, UTD’s total scholarship expense amounted to $200,119. University of Maryland at Baltimore County (UMBC) Chess Director Alan Sherman said chess scholarships have attracted students to UMBC that might not have otherwise considered the institution. These students use their chess scholarships to earn a degree for a future job. “Many of our finest chess player-scholars realize that their future lay in education and a professional career, not as a chess competitor. And so they leverage their accomplishment and talent in chess in their future,” Sherman said. In other media interviews, Webster representatives told reporters that at least six individuals from TTU would receive full scholarships to attend Webster. 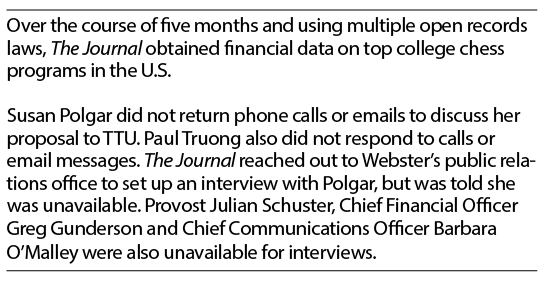 University representatives provided this information to several news organizations, including the Washington Post, St. Louis Beacon and defunct Webster Groves Patch. Furthermore, Grandmaster Liem Le told a Vietnam news website in 2012 that his scholarship package would cover tuition and room-and-board. “It is a full scholarship for four years, with a value of about $35,000 per year, including school fees, living costs, health insurance, accommodations, etc. I only have to pay for the airfare,” Le told the news website. University spokesperson Patrick Giblin said the majority of SPICE students receive academic scholarships comparable to the general student body, though Giblin was unaware if chess scholarships supplemented academic scholarships. Giblin was also unsure of the size of chess scholarships SPICE players receive. Addressing controversy stirred by Webster’s chess billboard on I-70, Chief Communications Officer Barbara O’Malley told a local television news station last November that none of Webster’s chess players receive “full-ride” scholarships. O’Malley said in an email statement she understands “full-ride” scholarships to be different from full-tuition, full-room-and-board scholarships. A “full-ride” scholarship, in O’Malley’s view, covers “everything.” Giblin said he understood “full-ride” scholarships to cover tuition, room and board, food, travel and also include a cash stipend. Giblin said Webster does not offer a scholarship like this. TTU declined Polgar’s offer, instead presenting a counter offer of a $100,000 increase in scholarship funding. Polgar presented another offer to TTU and made reference to a bid from a competing institution. Polgar told TTU administrators in an email correspondence obtained by The Journal that the competing institution had pledged at least $220,000 in annual scholarship support to SPICE. If TTU wished to maintain its relationship with SPICE, Polgar told TTU administrators their next bid would need to come within 10 to 15 percent of the competing institution’s. In the end, TTU declined Polgar’s offer. The university declined comment on the TTU proposal, saying it would be unfair to speculate on the proposal because Webster is not named in the materials. UMBC was the first school to build an elite chess team with scholarship aid. A six-time winner of college chess’s top prize, UMBC used its chess prowess to help bolster the university’s intellectual reputation. Witnessing the return on chess investment UMBC had generated, other schools moved to underwrite a chess program. The first was UTD, followed by the UTB. With the hiring of Susan Polgar in 2007, TTU entered the fray. And when Polgar moved to St. Louis, Webster became the newest elite chess program in the country. In 2012-13, the UTD, UMBC, TTU, and UTB chess programs provided a total of more than $550,000 in scholarships to their respective players. TTU secured funding for chess scholarships and returned to college chess’s top match a year after Polgar departed. A four-year, $280,000 pledge from a private donor will allow the team to continue to offer scholarships. TTU’s campus newspaper also reported in April 2012 that TTU would allocate $50,000 in annual scholarship funding as well.